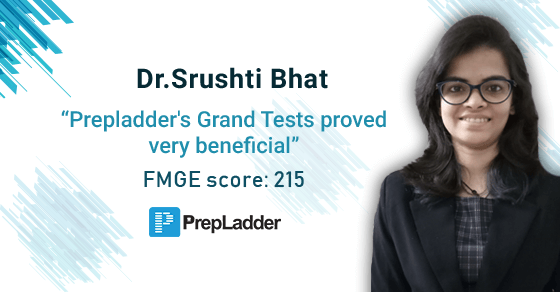 Prepladder congratulates Dr. Srushti Bhat on clearing FMGE June 2018 exam. We wish her all the very best for her career and future ahead. I'm Dr. Srushti Bhat from Smolensk State Medical University. I would like to appreciate the effort made by PrepLadder for conducting Pre-FMGE Mocks by Dr. Deepak Marwah. The exams really proved to be very helpful. I scored 178 and 194 marks in the mocks. This boosted up my confidence and finally, I was able to clear the FMGE June 2018 exam with 215 marks. Well, both Theory+ MCQs are equally necessary to be successful in this exam as it not only tests your theoretical knowledge but also the approach to questions. I would suggest each one attempting the exam to focus on theory for the initial few months and solve topic-wise MCQs alongside so you'll get an idea on where you lack and what needs to be improved upon. Solving MCQs regularly gave me an added boost that I was on the right track. Frankly, I started studying in the month of March with one aim in mind that I have to crack it in June. Constant support from near and dear ones played an important part in pushing me to achieve this. I tried my best to complete at least 15 subjects by May. However, simultaneous revision as soon as each subject is completed is equally important. I tried to revise the subjects at least 4-5 times, especially the major topics. June was the month where I solved as many mock tests as possible. Here, Prepladder's Grand Tests proved very beneficial. I used DIAMS class notes since I had very less time to go through any particular textbook. However, I suggest everyone to solve FMGE Solutions by Dr. Deepak Marwah. It does prove very helpful and builds confidence during preparation. Learn for 2/3rd part of the day (eg. Morn and Noon) and practice as many MCQs from as many sources possible for the rest 1/3rd (eg. after dinner before going to bed). Also sleeping is very essential at least for 7hrs every day, right from the beginning. This is what I followed and it did help me a lot. Definitely, yes. It did play a big role in my success. The mocks though tough, aided in improving my speed as well as accuracy in solving the questions. Yes, a timetable is an important factor during preparation. Also, sticking to it after you have prepared one will surely help in acing the exam. Yes, I am a gold medalist from my University. Some subjects which required frequent revision were Biochemistry, General Pathology, Pharmacology, Microbiology. Many other subjects were comparatively easier to recollect even if I hadn't revised them for quite some time. Avoid sticking to only reading the theory thinking that you'll be able to solve the MCQs based on the theory knowledge. The questions expect you to apply the theory which makes the exam tricky. So my advice is to try and read as much theory as possible but keep solving MCQs to back your knowledge. We thank Dr. Srushti Bhat for sharing her success story.